The apartment is situated in a unique location just around the corner from Amsterdam’s so called ‘Red Carpet’ area and offers views overlooking one of the widest canals of the city and prestigious Canal Houses. Amsterdam is known for being a compact city, and some of the nicest areas are within walking distance of the apartment. Think about De Pijp neighbourhood with bars, restaurants and exciting nightlife. The famous Nine streets shopping district, the Museum quarter with the Rijksmuseum, the Van Gogh Museum, and the art gallery area in the Spiegel-kwartier. All these great city marks are within a 10 minute walk away. This particular location is an oasis of tranquillity. Plenty parking spaces throughout the day and good transport links with the new metro line. With public transportation, Schiphol Airport is only 30 minutes away. Newly renovated, spacious apartment, completed by an architect in 2016. Open plan kitchen with high quality, oak wooden flooring, first class finishing materials and kitchen appliances. Due to the many windows in the apartment, there is an abundance of light. The living area has a beautiful view over the Keizersgracht. One of the remarkable features of this living space is the partly open ceiling, giving you views on the roof construction, wood and antique features. The backside of the apartment has the ingenious entrance, the dining setting and the entrance to the sunny roof terrace (+/- 10m2, south facing). As a separating area the architect has situated the cooking island right in the middle of this floor. In the top floor, the bedroom is situated in the backside. The luxurious open plan bathroom area with luxurious bath, separate toilet and a separate shower is located in the front. All utilised with first class sanitary appliances. The apartment measures 76m2 (NEN regulations) and has more than 18m2 additional custom build-in closets and storage space on both floors within the 1.50m2 height of the apartment. 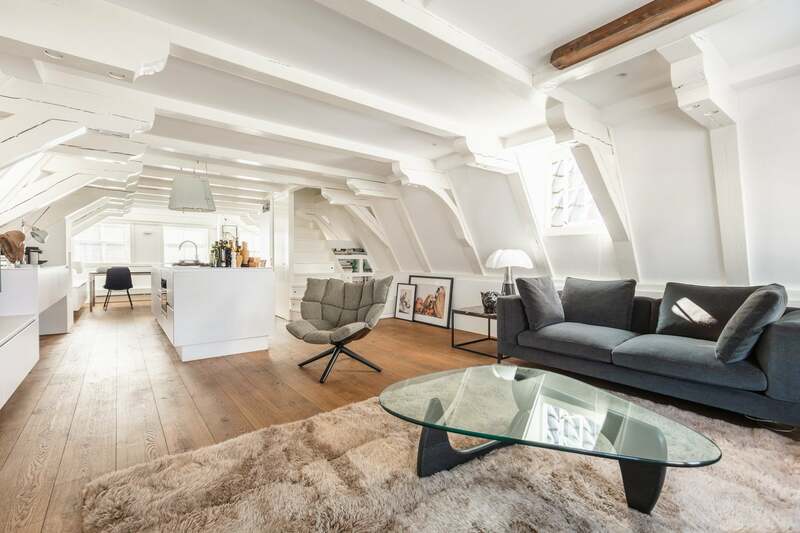 Overall, an apartment with a smart lay out, a modern atmosphere with a monumental signature and an excellent location in the midst of the Amsterdam canal area.